HANUKKAH celebrates the re-dedication of the second Temple in Jerusalem in BC 164. (Ist Maccabees 4.v.36f) The Temple had been defiled by the Persian invasion of Antiochus Epiphanes. He had imposed the worship of Zeus. Judas Maccabaeus led the revolt against Antiochus, and the Temple was purified and rededicated. They built a new altar, set out the loaves, offered the incense sacrifice and lighted the lamps. The remaining oil kept the lamps alight for eight days. The Temple had been reclaimed and was now fit for its purpose. 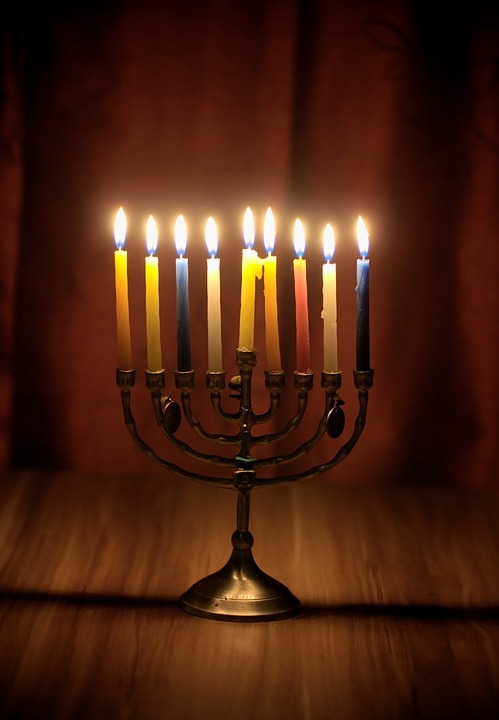 Every year, this festival of light is celebrated with the eight branched Menorah. In the time of Jesus, St John’s Gospel (10.22) refers to this as the Festival of Dedication. At another festival, the Passover, Jesus cleansed the Temple by driving out the animal sellers and money changers. He was reclaiming it as the house of prayer for all nations. I remember when I was Vicar in Shepherd’s Bush, discovering vandals in Church when I went to unlock it ready for a school service. The reserved sacrament and aumbry light had been stolen. A man was hammering to break down the vestry door; and hassocks were laid out and covered with the altar cloth like a giant bed. The vandals fled through the entry door they had forced. The children were due for their service in an hour or two. I contacted the School Caretaker, thinking we should cancel the service. But then I realised that the prayers of children would be the best way to reclaim the Church. We tidied the Church as best we could, and lit the candles for the celebration of the Holy Communion. On another occasion, I was returning home to the Church and found a Police cordon following some fatal shootings across the road, at Nando’s restaurant and the street outside. Nando’s had to close for repairs, so on the day it was reopened, a neighbouring Vicar and I went for lunch and sat in the table nearest the window. It was a very small gesture, but our support in reclaiming the restaurant for its true purpose. In Jesus, the light which enlightens everyone has come into the world.